It is never easy to kill the squirrel because the activity challenges you not only physically, but also emotionally however in many situations you are left with no other option because presence of these animals in house is something, which brings many negative aspects and worst of all they bring diseases as well as risks associated with health so in all cases you simply can’t allow the animal to roam freely in your property with so much confidence. The key is to kill the animal by bringing the least amount of discomfort means you should try to kill the animal in your yard, but using some effective strategies. Many are found questioning that What are some ways to kill a squirrel in the yard? To be honest there are more than enough ways and you should normally have to select one keeping in consideration the options, which are available. First of all it is very much important that you should start by taking away the prominent comforts or privileges, which your property is offering the animal like food sources, protection etc. Killing is always used as the last resort so you should first make attempts for capturing them using traps and relocation however, if you are left with no other choice then proceed with killing it by using of the below mentioned approaches. Shooting the animal wandering in your yard is the best possible way of killing it. However, for this you need to be a good shooter because you must never miss the aim. Head of animal should be your main target because when shot at head the animal dies quickly and experiences lesser pain. You can use a high powered air riffle for this purpose and be careful in handling the gun and take all the safety precautions in advance. Only move ahead with this approach if you are a good shooter otherwise don’t even think about it. Most importantly the laws of your state should permit the shooting of squirrel. 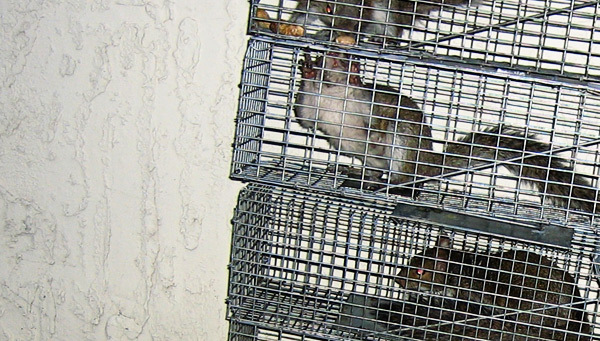 Lethal Traps are another way of killing the animal, which creates disturbance in your yard. Market is full of these traps, which come in different sizes and shapes so you will have to make the selection keeping in consideration the requirements. Popular ones include body grip traps, but you are advised that never use snap trap it will not bring the results that are required. Poison is another remedy, but it has little support and should only be used after great consideration. It brings a painful death for the squirrel at the same time there are chances that animal can become severely sick, but can survive. It is better that you should prefer to capture the animal alive. Go back to the How to get rid of squirrels home page.